Israel's key missile defense system is unique in the arena of global defense - but politics and cost are preventing investors from buying. The Iron Dome has proven to be an effective weapon against rockets fired from Gaza, Lebanon and the Sinai desert, with a success rate of about 90% in intercepting projectiles - and its unrivaled capabilities have no competition in the global arms market. But despite the Dome's boon for international security and trade, industries from around the world are reluctant to purchase the defense system from Israel for both practical and political reasons, a defense expert said Tuesday. 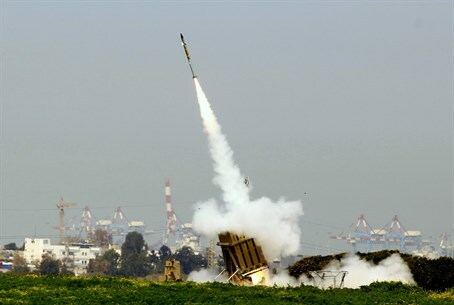 "The Iron Dome is tailored to meet the challenge of Israel's short-range rocket threat and missile threats from guerilla organizations," Avnis Patel, a member of the British RUSI Research Institute which organizes the annual ballistic missile defense conference, told Walla! News. As such, Patel said, the system's needs are too specific for many countries, who face broader threats or more long-range rockets. In addition, restrictions on the political reality of the potential target audience further reduces the possibility of selling the system, Patel said. Arab and Muslim countries - especially Gulf countries bordering Iran - would primarily benefit from the system, but many do not want to buy Israeli arms. Despite this, Israel has made at least one successful sale to another country, whose identity is kept under wraps due to mutual agreement from both parties. Yossi Drucker, the Vice President of the Rafael Armament Development Authority which produces the Dome, explained that the company is happy with this situation - since there is a much smaller potential for classified information and technology leaks. Drucker did hail the lone buyer, however, noting that the sale keeps the company afloat. He said "Rafael has invested many millions of shekels in the system's development. We could not afford it without selling abroad." Israel's defense industries export about 80% of its production, he said, which brings to the state about $6.5 billion each year. The system's development was completed following the heavy bombing by Hezbollah during the Second Lebanon War in 2006, and the first successful live test fire was held in 2009. According to a security source who attended the trial launch, Israel relied on the ability to export the "Iron Dome" from the beginning, adding that officers from foreign countries also were among those present at the experimental test. America's involvement in the development and funding system is known and recognized. Washington has invested more than a billion dollars to ensure Israel can deploy the "Iron Dome" for its self-protection - and made waves for citing that fact as a means of gaining political leverage on Monday - but has refused to buy it for its own troops in Afghanistan and Iraq. Riki Ellison, President of the US Pact to Promote Missile Defense, explained that one of the objections presented by the Pentagon is the cost of the system. He noted the need to lower the cost of each "Tamir" radar-guided interceptor missile, which is close $100,000. Likewise, the Department of Defense does not want to use system, because it does not provide protection against mortars. "The Iron Dome protects against mortar fire from a short distance, and the cost of acquiring the system for that alone is simply not feasible," Ellison stated. Rafael is currently working to develop an "Iron Beam" which will expand its mortar shell deterrence, by using lasers to explode the bombs mid-air. Nevertheless, Drucker stated that current incarnations of the Iron Dome can work against mortar shells - but that Israel did not use it for this purpose during Operation Protective Edge in Gaza. "From the beginning, we have built the system with maximum attention to design versus cost," Drucker said. "We did not put a single screw with cost in mind until the system was tested." He said the missile cost will be reduced if they are mass produced or if the company enters in a partnership with American defense corporation Raytheon. Until then, the $50 million battery cost will probably defer potential buyers. Israel's fishing for buyers for the Iron Dome system may concern Washington, Drucker suggested, as it could alert rivals China and Russia as well. Rafael has held discussions with South Korea and India regarding potential purchases, he noted - Seoul keeping abreast of developments with North Korea and India having been well-invested thus far in various Israeli defense technologies. But the possibility of either country buying the Dome is slim, experts say. "South Korea will have to spend a considerable sum to buy the system," Patel said, noting they would need several batteries to "divert the more extensive threat from a country like North Korea." India may be more keenly interested, according to Jeremy Bini, news desk editor Jane's Defense Weekly - not against regional threats from Pakistan, but to protect its interests in key areas. "I know that the Israelis have already implemented many safeguards around [India's assets]," Bini noted. "India wants to place Iron Dome batteries around its strategic assets to protect them as well."